Letter writing has become a lost art, and penpals may seem like an old-fashioned concept in today’s age of texting and social media. However, seniors remember the joy of receiving a handwritten note from a distant friend or family member. Corresponding with a penpal may also have physical and emotional benefits for your senior loved one. Social isolation and loneliness are common among seniors, especially those who live alone or who have physical limitations that make it difficult to leave their homes. Having a penpal gives your loved one the opportunity to share feelings, jokes, and uplifting messages with another person. Your loved one will have something to look forward to, and he or she can reread the messages to boost his or her mood. Strong social ties are essential to a senior’s wellbeing. Seniors who want to remain healthy as they age can benefit in a variety of ways when they receive professional home care. Oshkosh, Wisconsin, Home Care Assistance is here to help your loved one accomplish daily tasks, prevent illness, and focus on living a healthier and more fulfilling life. The act of writing and reading letters can help seniors exercise their memory and language skills. They will have to utilize various parts of the brain to recall stories and find the appropriate words. Writing also allows plenty of time for seniors to formulate their thoughts, which can make it easier for those who have communication disorders. Speech-to-text software and other technologies are also available for those who have limited hand and arm dexterity. Meeting new people face to face can be intimidating for seniors who do not interact with strangers on a regular basis. Writing to a penpal is a low-stress, non-threatening method of making new friends. With a penpal, your loved one will know there is someone one who is looking forward to his or her letters. If your loved one needs regular social stimulation, consider hiring a caregiver. For many seniors in Oshkosh, WI, live-in care is an essential component of aging in place safely and comfortably. However, it’s important for them to have caregivers they can trust and rely on. At Home Care Assistance, we extensively screen all of our live-in and 24-hour caregivers and only hire those who have experience in the senior home care industry. Our strict requirements ensure seniors can remain in the comfort of home with a reduced risk of injury or serious illness. Interacting with a penpal from another country can prevent your loved one from getting stuck in a boring routine, and it can also provide a different point of view of the world. Your loved one may pick up new hobbies and activities while exchanging information with his or her penpal. Hearing the thoughts and concerns of another person can also take your loved one’s mind off his or her challenges. 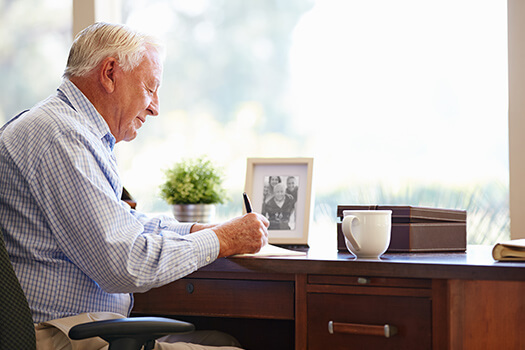 Even though letter writing is not a very physical activity, it can still have positive benefits on your loved one’s physical health, as it provides a way to exercise the joints and enhance fine motor skills and dexterity. Looking forward to receiving letters and knowing there is someone waiting for a response can also serve as motivation for your loved one to engage in other healthy habits. Social interaction is essential for older adults, whether it comes from a penpal or a visit from a compassionate caregiver. For families living in Oshkosh, Wisconsin, respite care can be a wonderful solution when their aging loved ones need companionship and socialization a few hours a week or just need minor assistance with daily household tasks. At Home Care Assistance, we thrive on helping seniors maintain their independence while living in the comfort of home. To learn about our revolutionary senior care plans, get in touch with one of our professional Care Managers at (920) 710-2273 today.